This is a totally unique shape- with AMAZING sparkle-ability. I loved this Sapphire the first time I saw it. The first second I saw it! We are known for diamonds, and diamond jewelry. 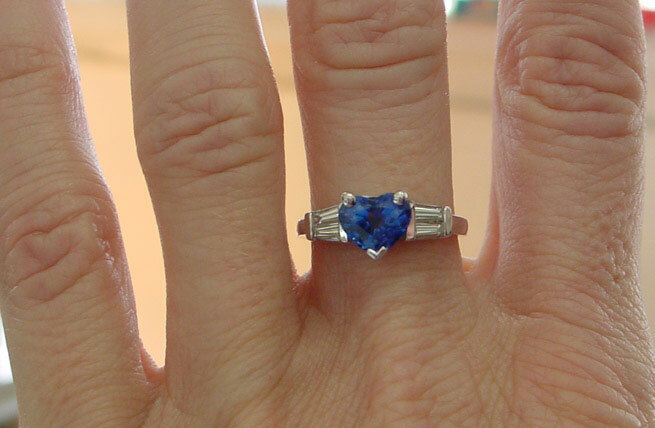 Lately, due to customer requests, we're carrying beautiful sapphire rings, like this one. The ring, built around the Sapphire and diamonds. The 4 tapered Baguettes are set to give 4 times the dazzle of two stones - if that makes sense. When you buy a ring like this from us it's covered by our lifetime workmanship guarantee.